Preheat oven to 175°C (195°C fan forced). Mix the florets with 2 tbsp of olive oil, salt and pepper. Roast on an oven tray in oven till nicely caramelised. Approx 10-12 minutes. Turning (stirring) halfway through. Meanwhile, sauté sliced onion in the remaining olive oil in stock pot. Try not to get any colour on the onions. Add the crushed garlic cloves, and fresh thyme leaves, keeping a small amount for garnish. Cook for a further 2 minutes. Add the vegetable stock. Bring to the boil then add the roasted cauliflower. Again, save some for garnish. Bring to the boil then, simmer for 15 minutes or until cauliflower is soft. Remove from heat. Cool slightly then blend till smooth with a hand held mixer or blender. Strain if required for smoother consistency. Place back on the stove and add cream if required. Bring back to simmer. Taste and adjust seasoning. 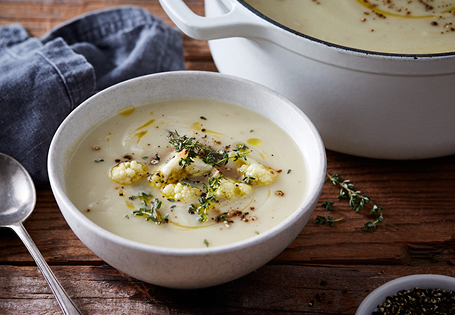 Pour into serving bowls and garnish with remaining cauliflower, thyme, cracked pepper and a drizzle of olive oil.